According to an article written by Jeffrey Schrank called, Death: Everyday about 5000 Americans Die, there are about 30 people who have died for every one that is living. And, if the 30 of your ghosts returned to observe us, they would notice how our schools teach all those things but the most important. (The schools do not offer ideas on how to live with the certainty of death. In just plain English, education avoids teaching us how to die.) Schrank concludes that much of our culture is a response to the fear of death. Historian Arnold Toynbee reached the conclusion: "Death is un-American". In the January 92 issue of In Health the following statistic appeared: 23% of the unmarried men between 45 and 54 will die in the next 10 years, whereas only 11% of the married men will. When asked why, the students gave reasons that varied between the idea that women do not have to work as hard, men have to listen to women, and hormonal differences between the sexes. When asked what the reason might be for evolution to create this situation, it was considered to be directly related to the increased survivability of the offspring. 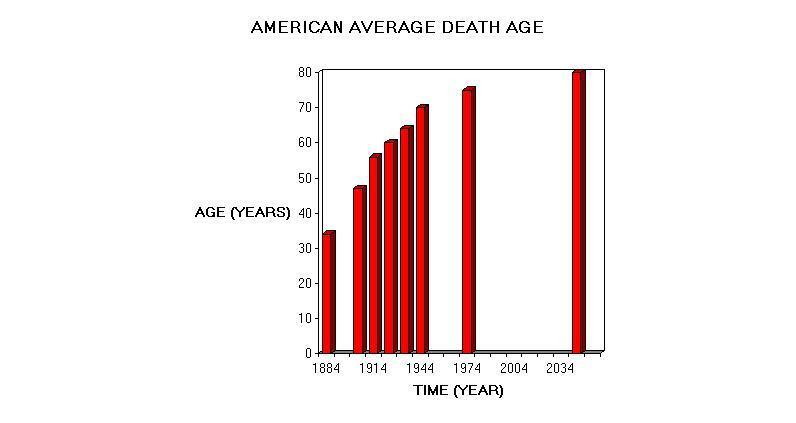 In 1900, 53% of the individuals between the ages 0 and 14 died. In 1975 it was 5%. Historically it was not uncommon to see the death of children in the home. In fact, in many old New England graveyards half of the graves are children. In 1900, 30% of the individuals between the ages 15 to 64 died. In 1975 it was 25%. Most of the 1900 deaths were due to women dying during childbirth. In 1900, 17% died at 65 or older. In 1975 it was 75%. As the trend continues the problems society faces in treating the elderly increases. Old age diseases will play a major factor in American society! 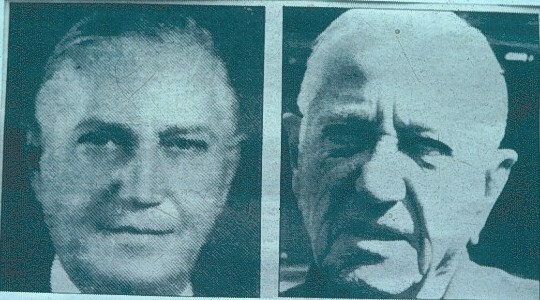 The same person with approximately 30 years added. 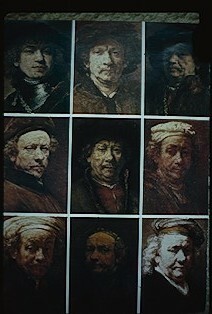 The above 9 self-portraits painted by Rembrandt illustrate the effect of aging. He painted them between the ages of 27 and 63. Rembrandt was born in July of 1606 and died in October 1669. Left to right from the top left to the bottom right Rembrandt's age at the time of each of the nine paintings was: 27, 46, 49, 51, 52, 54, 55, 58, and 63.